Carol Morley is one of this country’s most exciting directors, whose previous films, including the extraordinary documentary Dreams of a Life and her last movie, The Falling, has proved she is a filmmaker of enormous talent. 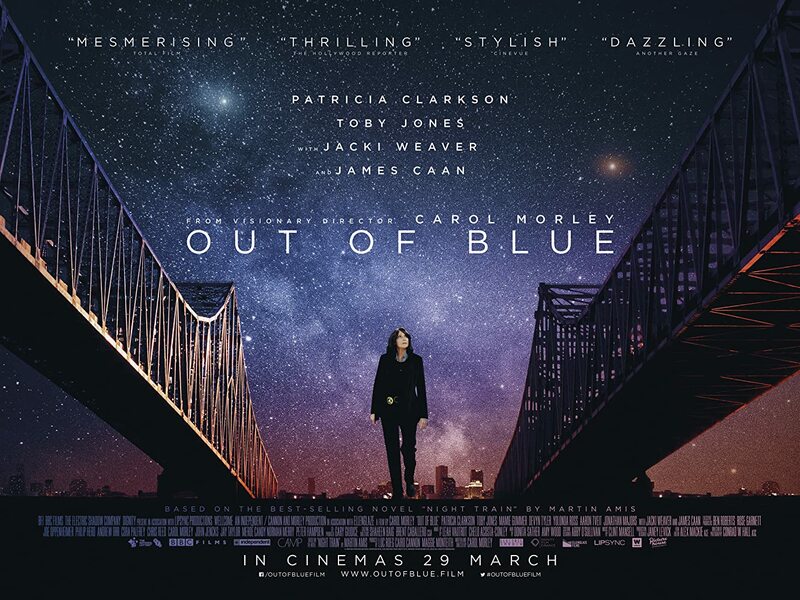 Her latest film, Out of Blue, a murder mystery that has far more layers than just a straight-forward whodunnit which, sadly, doesn’t always work. Detective Mike Hoolihan, a woman who is known for closing cases, is called in to investigate the shooting of leading astrophysicist Jennifer Rockwell. With all the clues in place, Hoolihan starts to find that the situation isn’t as straight forward as she first suspected and something in her past is causing her judgement to be muddled. Based on a novel by Martin Amis, this could have been a routine thriller in which there are some apparent suspects, but as the story plays out, nothing is black and white. In the case of this film, blue and red are an essential part of the film. As this is the death of an astrophysicist, space, black holes and the belief that we are all created from stardust is just as important as who committed the crime. Sadly, this side of the tale drags down everything else. Morley is a visionary when it comes to using the cinematic form, and this is a well-produced piece in which detail is imperative. The film is littered with the colours blue and red. The meaning of these two colours are never fully explained, and yet you cannot help but notice that the scarf of the victim is red, the barbules are blue. Each scene will have one or more objects with either of the colours. Another element that doesn’t quite work is the mentioning of Schrödinger’s cat, based on a thought experiment in which a hypothetical cat may be both alive and dead. Unless you are familiar with this, you may wonder why it runs throughout the film. Quite frankly, I didn’t understand it, and it is never explained. This was supposed to be a project for the late Nicolas Roeg, and you can see how this would have been possible. Roeg was known for his bizarre interpretation of works, being a visual filmmaker who would intersperse ideas and images that sometimes who distant you from the action. 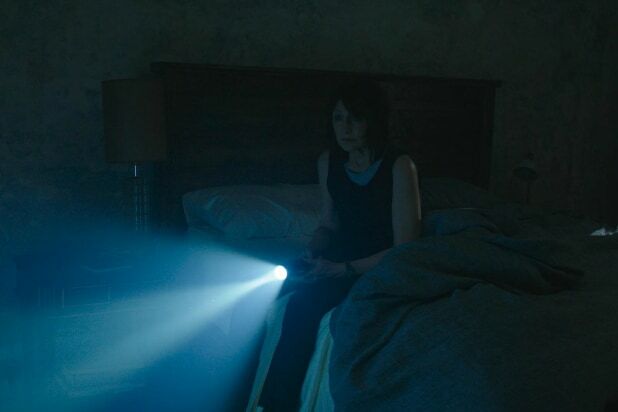 Morley doesn’t go the whole way, but with flashes of images that eventually explain themselves, it does often leave you baffled to exactly where this is heading, and thankfully, it does end up satisfactory. The cast manages to carry some of the heavy loads of the symbolism and more complex ideas by being incredibly strong. Toby Jones, playing a colleague to the victim, is always good value no matter what he is in, while James Caan playing the father of Jennifer is terrific and deserves more screen time. In the lead as Hoolihan, Patricia Clarkson is enormously impressive, playing cool and hard-edged while adding a sense of vulnerability. It’s a beautifully realised piece of acting. Out of Blue will undoubtedly be looked upon as a marmite movie. Some will absolutely love it and lap up the astrophysics while others will be annoyed and think the whole thing pretentious and dull. I’m a fan of marmite, and while I enjoyed the mystery part, I could have done without the science, instead, appreciate the performance of Clarkson, the cinematography and the twists and turns of the film’s main story. The rest just left me a little cold.